When I walked into the house I found that my Dad had not only started a load of laundry, but he had already bathed my Mom and had her all tucked in for the day. He was all ready to jump on his Harley and ride to work! What a guy. My Mom can’t sleep lying down on her bed right now so she sleeps in a recliner in the living room. My Dad, who is not feeling great with his cancer, won’t leave her side and sleeps in a recliner next to hers. He dotes over her and lovingly takes care of her every need. I’m so used to seeing my Mom take care of my Dad and it’s been so sweet to see the tables turned. They are such good examples. The kids and I had a list of things we needed to get done in town today, so we quickly left so that we could hurry back. Our main order of business was to finish the passport application process for Jonathan. His SS# finally arrived so we could do that. We went to the Post Office where they have a passport center, and were told that we had to have an appointment to be helped. The lady told me this as she leaned back in her chair, sipping coffee and updating facebook. I surprised myself and bit my tongue and refrained from speaking my mind. Gold star for me:) She told us to go to the court house and apply there, and once there we were told that in order to apply, he needed a State ID which we could apply for at the DMV. Once there, we were informed that I could not sign for him as his guardian because my drivers license is a California and not Idaho license. My sweet Dad came to the rescue and met us back at the DMV where he signed a form stating that Jonathan is allowed to use his Idaho address. The lady entered all the info in the computer and told us that his new SS# is invalid. Somehow after all the nonsense that we’ve been through with his paperwork, I was not surprised! The lady called the SS office and finally figured out the problem – it had to do with the way his name had been entered at the SS office. After some money, a photo and more paperwork, we received his temporary State ID. The real one will arrive in 3 weeks. With the temporary in hand we went back to the court house which was about to close, and completed a mountain of paperwork, paid the $25 ID filing fee and the $185 expedited processing fee and Bob’s your Uncle, it was finally over. I feel like I can relate so intimately. Just as soon as I ‘closed the passport tab’ in my head, 3 more tabs opened up! But, no worries, I’ve got this! The creatures and I ran to Winco which is our favorite grocery store, and when I turned my back to pick out some veggies in the produce isle, Mycah and Emma grabbed some hoops and began dancing around in the store. They are both little ninjas at it. So here’s an update on our Panama crew. At 1:40am, Danny texted saying that they were doing about 6 knots with 20 – 25ft swells on a starboard close reach. They had seen lots of lightning. 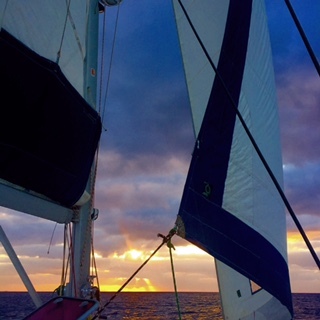 Jude took a 4 hour watch from 2:30am to 6:30am and had some good wind and medium seas. I asked if either of them had experienced any sea sickness and Danny said he popped a Bonine every once in a while just in case but that Jude hadn’t taken anything and hadn’t complained about feeling green at all. My Darling texted at about 3:30pm saying that he was starting to see some birds, which means that land can’t be too far away. A few minutes later he said he checked the GPS and they were 86 nautical miles from Isla de Providencia, which on this map is part of San Andres. They expect to make land fall there tomorrow and will be able to call me at that point. They’ll most likely spend the night at anchor and then set sail again on Sunday morning. I am so proud of them. What great sailors! Life is good. I’m so grateful for all we got done today and can’t wait for my brother to arrive here later tonight. Also, my Aunty Liz (my Dad’s sister), who is living in Australia now, will arrive here tomorrow night for a nice long visit. Only 6 more days till Kjira arrives!